A great summer movie about one day on a neighborhood street and the different groups of people who run out of patience with each other. 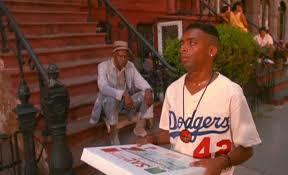 Do The Right Thing is a movie about one day in a neighborhood. that neighborhood is Bed Stuy, Brooklyn and it happens to be the hottest day of the summer of 1989. The characters in the movie all deal with the heat in their own ways, and they go about to their jobs or usual activities, the same as they would any other day, only because of the heat, people are a little angrier with each other than usual. at the very start of the movie we meet Mookie (a young Spike Lee) waking up in his bed, bothering his sister as she sleeps, and getting ready for work. Then we meet the Italian family that owns the local pizzeria, Sal’s. There is Sal, the father, played by Danny Aiello, and his two sons Pino (John Turturro) and Vito. from the moment they get out of their car and start to head into the restaurant, the two brothers are arguing. That’s because Sal tells Pino to sweep the sidewalk and Pino tells Vito to do it. We follow Mookie on his walk down the block, past Da Mayor (Ozzie Davis) and mother sister, the elderly people of the neighborhood. Mother Sister despises Da Mayor and calls him an old drunk, and still he has nothing but love for her. He thinks she’s beautiful and great, and just brushes off whatever insults she throws at him. Mookie makes it in to work only to be told by Pino that he has to sweep the sidewalk. Mookie is smart enough to know that Sal asked Pino to do it first, and he calls Pino on it. Vito is right there to tell Mookie that he’s right, and this sets up one of the major dynamics of the movie. It’s Vito and Mookie against Pino. That’s because Pino is the angry older brother with hate in his heart and Mookie sees the way he treats his younger brother, Vito. Mookie is able to talk to Vito and confide in him as a friend. In fact, Mookie is really friends with almost everyone in this movie, other than Pino. We get scenes of people going into the Korean grocery shop and scenes of people sitting on the sidewalk, talking about the Koreans who run the place. We see the young guys who hang out in the street messing around with fire hydrants and just enjoying the day. Martin Lawrence plays one of these guys. and then we also meet radio raheem, smiley, and buggin out. Those three characters end up being the villains of the movie, although I’m not so sure that it’s meant to be that black and white (no pun intended). Buggin Out is the first one to cause trouble. He goes into Sal’s sometime before noon and has a problem with Sal not putting any black people on his wall of fame. Sal’s got a wall full of photos and it’s of Italian Americans only. Sal tells buggin out that when he has his own place, he can put whomever he wants up, but since this is Sal’s place, he’s going to do whatever he wants to do. If Buggin Out has a problem with that, than he doesn’t have to eat there. A nearly unrecognizable Giancarlo Esposito, the actor who in the last two years or so, has handed us one of the great television villains of history, playing Gustavo Fring in Breaking Bad, plays buggin out. This character is right up there with Stringer Bell from The Wire, and we’ve all seen how idris Elba’s career has taken off since then. well, buggin out, Esposito’s character here, insists that it is not Italian Americans who are spending their money at Sal’s and eating there, but black people from the neighborhood. Sal doesn’t care and so Buggin Out decides he’s going to organize a boycott of Sal’s. Radio Raheem is another dude with attitude. he blasts his boom box wherever he goes, and the funny thing is he continuously plays the same song over and over again. It’s “Fight The Power,” by Public Enemy, and Spike Lee intentionally starts the movie off with this song even though radio raheem is nowhere to be found. That’s because Lee wants to really get that song in our heads so that when we do start spending time around Radio Raheem, we already feel like we’ve been listening to the song for a while. That, and the fact that it’s incredibly cheaper to use the same song again and again than to pay for each different song in a movie. 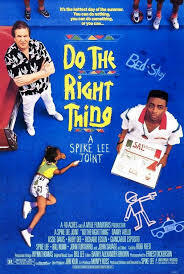 And do the right thing was made on a very small budget. Radio Raheem has a problem with Sal because Sal doesn’t want the guy blasting his boom box when he comes into the restaurant. When Radio Raheem and buggin out join forces, there’s no turning back, and it doesn’t make any difference at all that they are both friends with Mookie who works at Sal’s. These two guys, who end up pulling the mentally challenged guy of the neighborhood, Smiley, into their group, represent the conflict of the movie. And things really do heat up as the film goes on, leading to an explosive climax. But throughout the day, leading up to this, it’s fun to just spend time with the characters and get a sense of their relationships. There’s a lot of anger going on in this neighborhood, whether it’s the young Hispanic kids vs. the African Americans, or the Koreans vs. everyone else. we meet the local cops in the area, who are set on preventing violence, but not on taking reports about things that already happened in the past. they have a great scene with frank Vincent after his car gets doused with water. And Sal has his own things going on. Not only is he trying to mediate between Pino, Vito, and Mookie, but he’s also got a thing for Mookie’s sister, and Mookie isn’t so cool with that. There’s a lot going on in this movie, and it’s a very interesting and enjoyable film. It’s an experience, spending the day with these characters, as they battle to get through it, and make it out safe, and the movie definitely builds up and gets more intense as it goes on.